Editors note: This article is part of a five-part package dealing with operating costs in 2017. 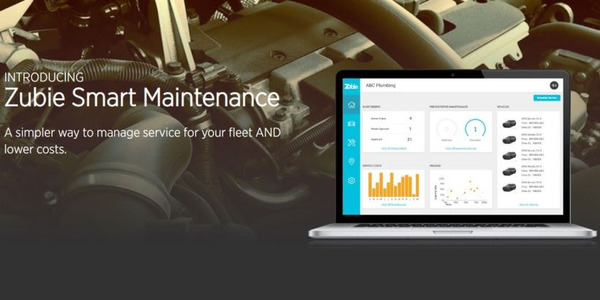 Read related articles that offer and in depth look at fuel spend, fleet maintenance, and preventative maintenance, as well as an overview of operating costs in 2017. Replacement tire prices remain stable, but they are starting to experience upward pricing pressures due to higher prices for the commodities used to manufacture tires. Predicting future tire costs is very difficult due to the many variables that influence tire pricing. The unpredictable cost variable for tire prices is the price of commodities, such as oil, rubber, and steel, which are three key ingredients needed to manufacture tires. Raw material prices are up 5% to 10% in 2017. There is an ongoing trend to larger diameter tires and unique tire sizes, which are more expensive. Run-flat tire purchases have declined among fleets due to low ROI. Reduction in snow tire purchases as fleets are acquiring more AWD models. Telematics data and predictive modeling is increasingly being used to modify driver behavior that impacts tire wear. “After more than five years of declines in the price of raw materials, without associated reductions in retail prices, the tire industry has been moderately successful in increasing prices in 2017, primarily based on a short-term spike in the cost of raw materials, specifically natural rubber. 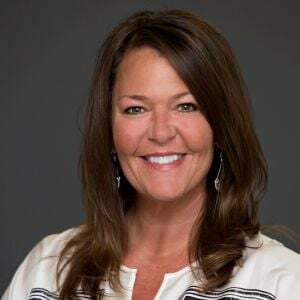 We have observed some tire manufacturers increasing prices by as much as 5-7% from the previous year,” said Kelley Hatlee, national service department customer support supervisor for Enterprise Fleet Management. Making a similar assessment was Christopher Foster, manager, truck account administrator for ARI. “The raw commodity price of natural rubber has seen moderate increases due to shortages in supply, increased demand, and weather related issues in the regions of the world where rubber trees thrive. This resulted in periodic price increases by a majority of the manufacturers throughout 2017,” said Foster. The bottom line is that tire costs are driven by raw materials cost. If raw material prices stay consistent, tire prices stay consistent. These costs control most of the fluctuation in tire prices. “In the beginning of 2017, we saw a price increase in the raw materials used to maketires. This was primarily due to weather related shortages, which resulted in some tire manufacturers raising prices multiple times. This is something we will be monitoring closely for the remainder of 2017 and going into 2018,” said Mark Ackerman, director of maintenance & repair management for LeasePlan USA. Both consumers and fleet customers have enjoyed flat prices resulting from the downward pressure on commodity prices following the slowdown in the Chinese economy, which is the No. 1 purchaser of raw materials. As the Chinese economy stabilized and started hitting its economic growth projection, the futures market anticipating greater demand for raw materials started exerting upward pressure on commodity prices. This will have a direct impact on future fleet costs. 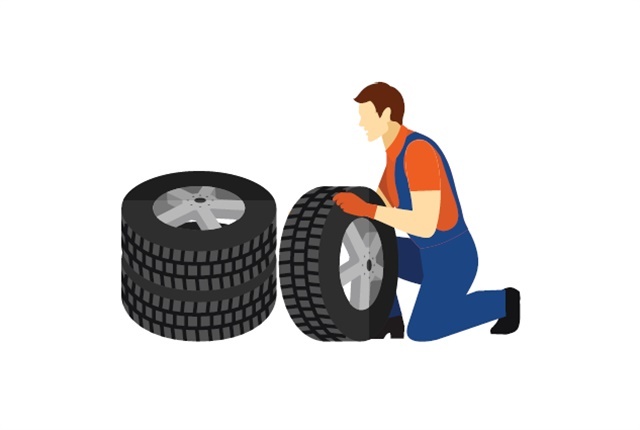 “Replacement tires is one of the top fleet expense categories. 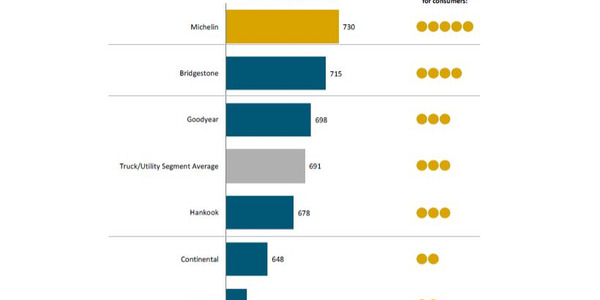 In our fleet, replacement tire costs were generally the fourth-highest operating cost for all segments. Compared to 2016, overall tire costs increased within all segments, which is attributed to pricing increases by many of the major manufacturers,” said George Albright, assistant director of maintenance for Merchants Fleet Management. On average, raw material prices are up 5% to 10% in 2017, and the safe bet is for a continuation of current prices into calendar-year 2018. But this forecast, based on past experience, can change quickly given the volatile nature of the commodity markets. Another factor exerting upward pressure on replacement tire costs is the ongoing trend to larger diameter tires and, occasionally, unique tire sizes. 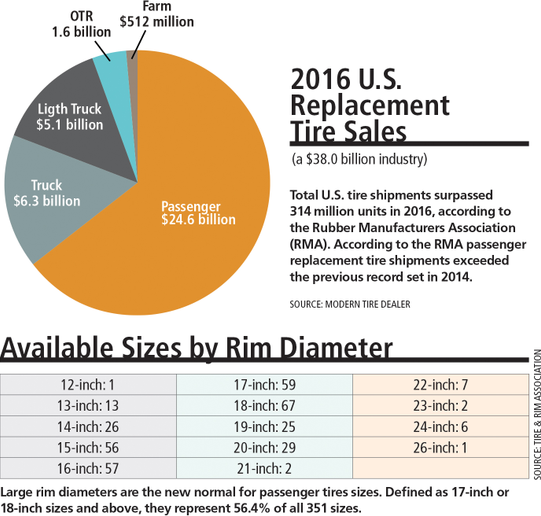 As auto manufacturers develop unique tire sizes for new-model vehicles, it impacts the replacement tire supplies for one to two years, as other aftermarket tire companies may not immediately meet the demand for these tire sizes. This lag time limits the selection and availability of replacement tires in the aftermarket. The increase in OEM automobile wheel diameters has driven up the price of fleet replacement tires, primarily because the larger the tire, the greater the manufacturing expense. 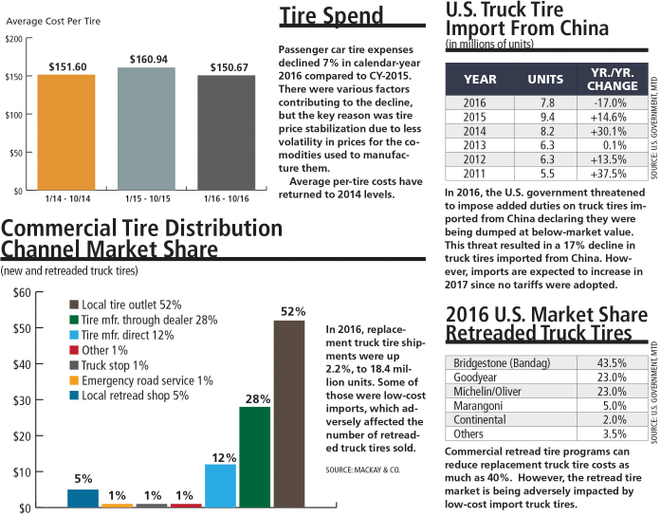 “In addition to the raw materials increases, larger vehicle tire diameters have also impacted overall tire pricing, which has, in turn, helped to increase total costs,” said Albright of Merchants Fleet Management. Unique tire sizes and specs on certain vehicles pose a challenge to fleet managers when a replacement tire is needed, but hindered, because there is often limited product availability. Not only is there limited availability of unique tire sizes for individual vehicle models, but there may also be a limited number of store outlets that stock them. The availability of a replacement tire depends on many factors: volume, production costs, type of vehicle, and whether the tire will be profitable. Therefore, in some cases, there could be only one tire manufacturer with a replacement tire that is suitable for that vehicle. The trend to larger diameter tires was started in the retail market by consumers who wanted a better look for their vehicle by having a larger tire/wheel assembly to fill their wheel well. When new OE tires are introduced, there tends to be a lag in how quickly the replacement tire industry can gear up to manufacture comparable-sized tires. “We are keeping an eye on the frequency at which manufacturers change tire sizes. Where tires increase in size, are lower profile and/or unique in size, higher costs may be expected,” said John Wuich, vice president, business analytics at Donlen. But, with the larger tire sizes on vehicles, the wheels are more prone to damage from pot holes and other road hazards. “With a larger catalog of fitments and increasing raw material costs, fleets are seeing a slight increase in tire expenses. 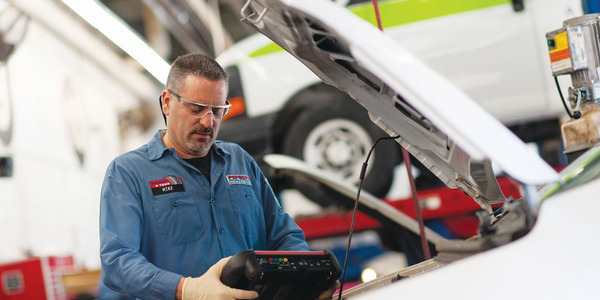 OEMs continue to bring new size requirements to the market for their new models, creating manufacturing pressure and driving up costs,” said Dale Jewell, manager US maintenance for EMKAY. Although there have been price increases in replacement tires, it impacts consumers more so than fleets, which tend to buy from national account vendors based on pre-negotiated prices. “Earlier this year many of the tire manufacturers announced tire price increases citing the rising costs in raw materials. Our supply chain management team mitigated our client’s impact through leveraging relationships to improve availability of base model tires. Goodyear recently announced a new winter tire made from a soybean oil-based rubber compound. They report that the compound enhances tire performance in dry, wet and winter conditions. With the reduced use of raw materials, this type of manufacturing offers the potential for more stable tire pricing in the future,” said Jeff Whiteside, assistant vice president of manufacturer relations and repair services of Wheels Inc. The trajectory for replacement tire prices in 2018 is upward due to current commodity pricing. “While there was some slight fluctuation both up and down in several categories, overall there was not a significant difference in tire costs in 2017 compared to 2016,” said Foster of ARI. Higher commodity pressures exert pressure on tire OEMs to maintain margins as their production costs increase. “While tire costs were stable in 2016, we have observed price increases by several of the manufacturers in 2017, primarily attributed to the increase of raw materials costs. Manufacturer increases of 7-8% in tire pricing have been observed in several instances and up to 14% with one manufacturer,” said Albright of Merchants Fleet Management. In the end, commodity prices dictate replacement tire costs. “Tire pricing is rising due to higher cost of raw materials and larger catalog of tire sizes,” said Jewell of EMKAY. It is anticipated that replacement tire prices on light vehicles will continue to increase next year to compensate for higher raw material costs. Furthermore, there is upward pressure on prices for truck and bus tires, largely in response to the incertainty about possible tariffs on commercial truck tires imported from China. “Tire cost increases are expected to drive total operating cost increases in the upcoming year. Some of our fleet customers with medium- and heavy-duty vehicles are leveraging non-traditional replacement options, such as commercial retread tire programs to reduce costs as much as 40%. 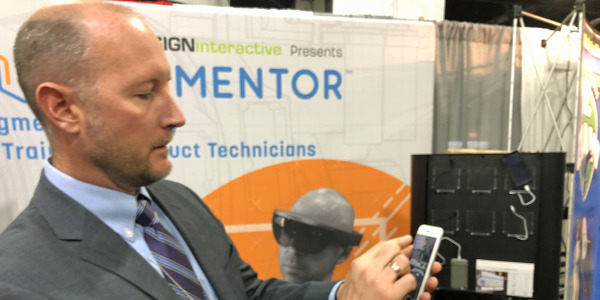 Additionally, more tire manufacturers have developed support teams designed to help fleet customers and FMCs with making targeted tire selections,” said Albright of Merchants Fleet Management. Barring unforeseen events, the industry consensus is that commodity prices will be higher in 2018, led by higher natural rubber prices, which will translate into higher tire prices. “The market shows signs of increased volatility in the coming months/years,” said Hatlee of Enterprise Fleet Management. The magnitude of the price changes will be determined by the sustained strength in prices in the commodity markets. The confluence of these many factors international commodities market and product development trends, point to higher replacement tire prices in 2018. The cost of commodities used to manufacture tires, such as the price of oil and rubber, continues to be the key factor driving the price of replacement tires for passenger cars. “Current market conditions make it difficult to expect anything other than a slight increase in tire prices” said Jewell of EMKAY. There are a variety other factors that are impacting replacement tire costs. Run-Flat Tires: “Run-flat tire purchases are almost nonexistent. 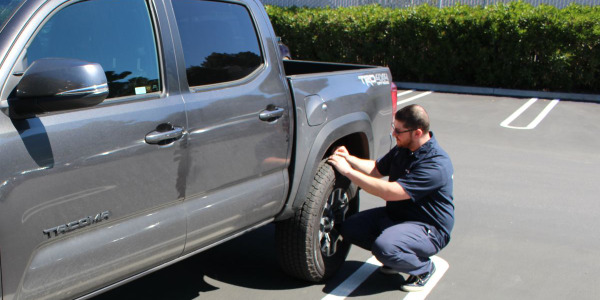 Some clients experimented with the purchase of run-flat tires because vehicles did not come equipped with spare tires, but in almost all cases, clients are foregoing run-flat tires as an option for tire replacements,” said Mark Lange, CAFM, managed maintenance consultant for Element Fleet Management. In addition, fleet managers report driver complaints about the ride quality of run-flat tires. Premature Wear Issues: “We’ve seen some models of vehicles have tire wear we would consider to be premature or excessive. 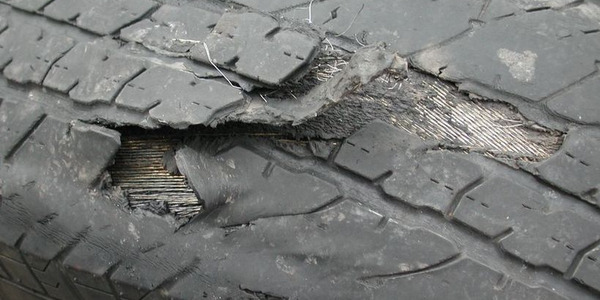 This has led to more tire replacements and added operating costs,” said Lange. ROI on Eco-Friendly Tires: Low-rolling resistance tires, also known as eco-friendly tires, have demonstrated the capability of increasing a vehicle’s fuel economy; but they have a higher initial cost and faster tread wear. Fleets report that there has been a longer-than-anticipated ROI for the higher cost low-rolling resistance tires. Moving to low-rolling resistance tires when replacing tires may not prove cost-effective for a car fleet as the ROI may extend beyond typical replacement cycle. Telematics: “Through the use of telematics data and predictive modeling, we have gained a better understanding of the impact of driver behavior on tire wear and, ultimately, costs. We are now better at understanding how acceleration events, harsh deceleration events, over speed hours, and climate region all statistically impact tire wear and spend,” said Wuich of Donlen. One factor influencing replacement tires for Euro-style vans is the popularity and growing number of units in fleet operation. Sales of Euro-style vans have exceeded total sales of traditional body-on-frame vans since 2015. “Minivans and full-size vans saw a decrease in the average price of tires. This is a change from last year, when the influx of new vehicle models — such as European-style vans — increased prices as there were fewer competitive options for specific tread patterns and sizes,” said Christopher Foster, manager, truck account administrator for ARI. There is now greater availability of Euro-metric sized tires in the aftermarket. 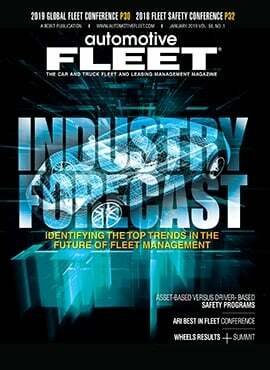 “Euro spec tires (full-size vans and small vans) are more common, and in most cases, availability across several manufacturers has increased and tire costs have remained flat or even lower in these cases,” said Mark Lange, CAFM, managed maintenance consultant for Element Fleet Management. Manufacturers are adopting Euro spec tires that are helping to keep replacement tire prices down. “Tire costs have remained flat this past year. One factor increasing the costs has been the introduction of Euro spec tires and the popularity of vehicles equipped with these tires. In some cases, a vehicle that historically had replacement tires in the $125-$150 range are replaced with a vehicle with Euro spec tires that have a cost of $275 each,” said Chad Christensen, senior strategic consultant for Element Fleet Management. 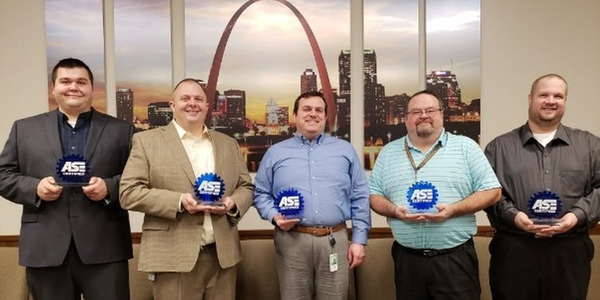 Agreeing that the greater availability of replacement tires for Euro-style van is helping to stabilize costs is Kelley Hatlee, national service department customer support supervisor for Enterprise Fleet Management. “OEM tire fitments have trended toward larger wheel diameters, which resulted in rising tire prices. Additionally, fleet compositions have experienced a growing percentage of Euro-style vans, which require tires meeting European specifications. The supply, variety, and pricing options for these tires were limited earlier in the year,” said Hatlee.